Life and study without a wall of books is unthinkable. That well describes the pastor’s and my experience. The use of books in pastoral ministry is a necessity and a delight. I work amidst leaning stacks of books. Sometimes one author says all I need; at other times, I need to take counsel in many. The best of them are always pointing to, explaining, and upholding Scripture. Their company is an encouragement. They (books and authors) are my friends and mentors. Along with a number of books I am currently reading from in my studies of the Sermon on the Mount, I usually have a few other books on the table to supplement my studies of the Bible and theology. Carl F. H. Henry, a man of books and the author of books. In recent weeks, I have been reading from a new book called Recovering Classic Evangelicalism: Applying the Wisdom and Vision of Carl F. H. Henry by Gregory Alan Thornbury. (It is published by Crossway Books.) I have known of Dr. Henry for years and have read some of his books. His greatest and most daunting work is his six volume God, Revelation, and Authority. I got that set last year and have only glanced through portions of it. I will probably tackle Henry by reading some of his shorter works and referencing his massive works little by little. Thornbury’s study of Carl Henry is a great spur to understanding and appreciating this pillar of evangelical theology. Carl Henry was a great thinker and defender of Biblical Christianity. A few years back, I gave some lectures on pivotal Calvinist worldview thinkers. Every book I read opened the doors to more studies. There beyond the great Dutch Calvinists and American Presbyterians were others, such as Carl F. H. Henry. Henry was a defender of orthodox theology and God’s revelation. I could not yet begin to describe whatever limitations or faults he might have had in his theology. My goal at this point is to understand and appreciate. Henry, by the way, attended Wheaton College many years ago and was mentored by Professor Gordon Clark. A serious study of a serious Christian thinker. I also picked up another book in recent days and started reading it. This book is titled The Minister in His Study by Wilbur M. Smith. I cannot find a picture of it on the Internet. It is a Moody Press book that was published in 1973. The dust jacket has a picture of an older Professor Wilbur M. Smith looking solemn and wise, standing in front of a wall of books. There is no way this cover would have boosted book sales, but I am more interested in learning from a book by a man with 25,000 volumes than I am in cover art. This is a book about books by another great Christian thinker. I read Smith’s book Before I Forget some years back. It detailed his life and beliefs during the tumultuous years when Princeton Seminary and Presbyterians were battling over the essentials of the faith. J. Gresham Machen led a corp of teachers and students out of Princeton and started Westminster Theological Seminary. Smith was there and was a supporter of Machen. I also have Smith’s book Therefore Stand. In The Minister In His Study, Smith rattles off essential books that a minister needs to have and use in his Bible studies. I love books about books, but this one is sending me reeling. Prof. Smith, who taught at Moody Bible College, Fuller Theological Institute, and Trinity Evangelical Divinity School, urged, encouraged, and assumed that the pastor would spend 3 hours a day, five days a week, working on a sermon. He also assumed and encouraged pastors to read extensively from a number of Bible and theological encyclopedias. Dr. Wilbur M. Smith, scholar and teacher. That is a big order. As a teacher, I see some students who love history, some who love to read fantasy, some who love both, and some who love neither. This book is subtitled A Magical Novel About the History of Western Civilization. The fantasy-loving kids might very well read it on their own. The key to a good book is that it is read willingly, not just because it is required. If the student is primarily interested in history, he might have to be prodded along a bit to read it. But everyone needs to see and read beyond their own personal interest area. As for the students who like neither history nor fantasy, we might have to reconsider the good benefits of flogging. On the other hand, we should be patient (but nevertheless, demanding). The Jericho River includes many of the traditional, ever-recurring, never failing elements of story-telling. First, there is a quest. Second, there is a journey. Third, there are companions. Fourth, there is redemption. In those last four sentences, I have described all of the literature of the world. I have also described every life that has been lived. Every story contains a fictional, fantasy element. Every story is magical. If I tell you about my canoeing experiences of bygone years, something magical and fictional takes place. You hear and likely visualize a much younger me and a canoe and a river. You are “seeing” something, but not the actual thing. You enter into a world where you are on a river, seated in a canoe, feeling the pressure of the water as you paddle through your imagination. A major theme of this book is the presence of lumins. In this book, lumins are mythical, magical creatures that inhabit the world and serve as protection or aid to humans. They are the magical and fantastical feature of the book. In fact, the whole conflict in the book, which stretches from the “real world” to the magical world of Fore is the existence of such magical creatures. Just as Tolkien created Middle Earth and Lewis created Narnia and Faulkner created Yoknapatawpha, so Carthage has created the world of Fore. Central to Fore is the Jericho River which is history. Travel to one part of the river and you are in ancient Sumer. Travel up river and you go through the civilizations of Egypt, the Hebrews, the Greeks, Romans, the Middle Ages, and up to the present. Like Narnia, time in Fore is different from time in this world. But dangers there can end your life in this world. 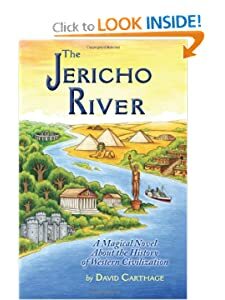 The story in The Jericho River is that of a boy, named Jason Gallo, who is trying to find his father, Professor William Gallo, who is lost in Fore. Throughout the book, we have snippets of lectures and writings from Professor Gallo, who is an historian. These snippets range from broad explanations of historical events to trivial but highly interesting tidbits (which pretty much explains most of the work of historians). Jason faces a number of threats and dangers. This is, after all, a river novel. Following in the tradition of Mark Twain, a journey down a river is filled with a multitude of life experiences. And journeys cannot be alone. Jason meets a number of people and has a group of companions, notably, Tia, an Egyptian priestess, Zidu, a lion-featured lumin, and Rim-Hadad, a more murky character (perhaps comparable in personality to Gollum). No plot outline or spoilers will follow. Instead, I will deal with and answer some objections or concerns. First, this is not Christian fantasy. I don’t think that Tolkien or Lewis were specifically trying to write fantasies about Christians, but it informed their worldview. If someone is shocked at a critical reference to the Bible story or to a curse word or two (and only that much), they will find such objections here. I honestly don’t know enough about the genre, authors, and works in the field of fantasy to know how to evaluate this work. Personally, I believe in training students to detect things they don’t agree with and to read on. If I operate on the premise, “I don’t agree with some of the things this author has said, so I am not reading this work,” my library is gone and my reading life is over. Third, fantasy involves entering into a different world and into a world where there is a certain magic, or a certain way that things happen. As it happens, the landscape of Fore is Western Civilization. The magic has reference to the spells and uses of shamans and lumins. Fourth, the novel is meant to be fun. But, in some sense, aren’t they all? Literature is written for pleasure. Certain types of books are demeaned as being “escape reading.” But when is an escape necessary? Anyone who has watched World War II movies knows that the first duty of a captured prisoner is to find a way to escape. So, we are all trying to escape the mundane, the trivial, and the unimaginative. So even if this book is used in the classroom, the end goal should be the reader having enjoyed the experience. Faulkner and Hemingway: Biography of a Literary Rivalry by Joseph Fruscione. Every now and then, I read another portion of this fascinating study of two vastly different 20th century American authors. Both were gifted; both hit the bottle too much; both needed some moral reclaimation, but both penned some great books. Had they literally had a fight, assuming they used fists and not shotguns, Hemingway would have easily won. But when it comes to telling an essential story, writing in an epic fashion, creating a fictional world, Faulkner leaves Hemingway looking like the great fish at the end of The Old Man and the Sea. Poor Faulkner, indeed. He wrote circles around Hemingway. Richard Marius was a southerner, from Tennessee, who was teaching writing at Harvard when he was drafted into teaching a course on Faulkner. This book grew out of his introductory lectures on Faulkner’s first thirteen novels. I lament never having had a course on Faulkner. In fact, I am not sure I ever had a class where any Faulkner story or novel was assigned. I am thankful for the encouragement of my college freshman English teacher, Sharon Drake, who did encourage me to do my research paper on The Sound and the Fury. The abundance of good, funny, profound, and creative images on the Internet for New Calvinism is itself quite amazing. Over the past year or so, I read three books that have some common denominators regarding Calvinism. All three are evidences of the new found interest, growth, and acceptability of Calvinism or Reformed Theology. Letters to a Young Calvinist: An Invitation to the Reformed Tradition by James K. A. Smith (Brazos Press, 2010). Young, Reformed, and Restless: A Journalist’s Journey With the New Calvinists by Collin Hansen (Crossway, 2008). Killing Calvinism: How to Destroy a Perfectly Good Theology from the Inside by Greg Dutcher (Cruciform Press, 2012). This isn’t Loraine and Arthur’s Calvinism anymore. * Surely “Dutcher” is a name with Dutch roots, but it doesn’t sound like Berkof, Bavinck, Warfield, Machen, and Hodge. Mr. Dutcher pastors a church called Evangelical Free Church in Maryland. He even admits that his congregation is not totally or self-consciously Calvinistic. Mr. Hansen is a journalist with Christianity Today. His book is based on travels across the United States visiting Calvinistic churches and conferences and meeting the popular preachers and authors. Well, at least Professor Smith has some of the traditional credentials: Professor of Philosophy at Calvin College; visiting professor at Calvin Theological Seminary and Reformed Theological Seminary in Orlando. While Dr. Smith has authored some weighty tomes, this book is a series of letters written to an imaginary friend where the older, wiser Calvinist cautions the young Jesse on some of the missteps that many of us know well from experience. The covers to the books themselves are fun, attractive, and light. The feature a wilted tulip, a “Jonathan Edwards is my Homeboy” shirt, and a postage stamp with Calvin on it. What a contrast to those days of old when Presbyterian and Reformed Publishing Company had basically one cover design, if the book were published in paperback. Killing Calvinism: Eight chapters and 111 pages. Light reading, but very convicting and convincing. Young, Reformed, Restless has 7 chapters and 158 pages. It is a travelogue of experiences and conversations among today’s most popular Calvinist speakers and writers. Letters to a Young Calvinist consists of 23 letters. It is informal and quite instructive. I learned quite a bit and was reminded of myself while reading it. I was really convinced then that Calvinism was a more sound, more hearty, more theologically rigorous, more Biblically consistent view than its alternatives. It was heart and soul defining and life changing. I still believe that. Calvinism has changed my church’ affliliation from my youth and it changed my career path. What I did not always realize was the power of God’s Word. In one sense, I was convinced that God sends revival. Laboring among the few, worshipping in small groups, often caused me to lose the vision of how Calvinism could burst the bonds of even its devotees. With the continued outflow of books, from Banner of Truth titles to Baker, Zondervan, and Eerdmans to the small, new publishers, Calvinistic and Reformed works moved from a few niches on the bookracks to whole shelves. Al Gore’s invention of the internet will likely be ranked alongside of Gutenberg’s printing press as a major means of mass producing materials. Along with an endless number of useless links to increasing irrelevance (meaning, many blogs, lots of websites, and most of what appears on Facebook), a whole library of Reformed writings, a veritable Geneva, exists at the click of a mouse. God used the Roman Empire’s infrastructure to spread the Gospel in the first century. He used Gutenberg in the 1500s; the British Empire in the 1800s; America from its beginnings to now (God have mercy on us now); and modern printing and technology today. I suspect you can get an app on your I-phone that will put more solidly Reformed theology at your fingertips than J. Gresham Machen could have found in the library at Princeton Theological Seminary in his day. So, Jonathan Edwards is a popular theologian again and a hero to many young people. Oliver Wendell Holmes’ poem “The Deacon’s Masterpiece, or The One-Hoss Shay” (1858) lampooned Edwardian theology and celebrated its collapse. “And who in the world is Oliver Wendell Holmes?” people now ask. Just a few years ago, a CNN/Time poll in April 2009 showed that the number 3 potent idea was “New Calvinism.” John Calvin has been referred to as “the Comeback Kid” and pastors like John Piper, Tim Keller, and Mark Driscoll are shaking the Christian world. What is the New Calvinism? What is happening in this resurgence of an older theological tradition? And what does this theology look like? First, the New Calvinism seems not to be as “terminologically restricted” as the older Calvinism. In my experiences, it took quite a while to get down all the terms, such as Calvinism, Augustinianism, Reformed theology, the five parts of TULIP, Arminianism, and, of course, the indispensable term, the Synod of Dordt. “Back in my day,” we learned the language and then spent a great deal of time explaining ourselves to others who did not know what we were talking about. This doesn’t mean that Biblical theology doesn’t require some terminology. But it does seem like the New Calvinists are more oriented toward simpler, less abrasive, more Christological ways of speaking. There are even Calvinist rappers. With t-shirts, web-sites featuring Reformed humor and cartoons, and easy-breezy books, a New Calvinist can talk to and communicate with anyone–an Arminian, a Charismatic, a lost person (highly encouraged now), an atheist, and perhaps even a theologian. Second, the New Calvinists don’t seem to be as isolated. In the pastk, I thought that a Calvinistic church meant small congregations with hard-to-sing songs and theologically challenging sermons. People in the past would compare the churches I attended to seminary. Inside the church, among the faithful, there was an urgency to learn, a compelling drive to catch up on what we had missed in the milky preaching of the past. Expository preaching, quotes from theologians, thelogically accurate terms, and historical vignettes of the good, the bad, and the ugly in church history were all part of the Copernican Revolution of Calvinism. Many people, for reasons good and bad, shied away from such churches. It wasn’t easy. The life stories of Spurgeon and J. Gresham Machen were testimonies of the cost of theological fidelity. In some ways this pnenomena reminds me of the two vital symbols in The Iliad and The Odyssey. 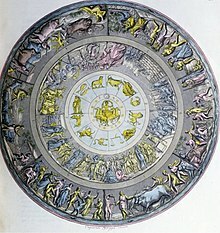 In The Iliad, the key symbol was the Shield of Achilles, fashioned by Hephaestus. Its artistry featured the entire Achaian world, ranging from farm life to city life, from peace to conflict, from individuals to the group. This hard, metallic instrument for war symbolized Achilles’ fight and ultimate sacrifice for that world. The world that Achilles is fighting for: The hard, metallic instrument for war–The Shield of Achilles. 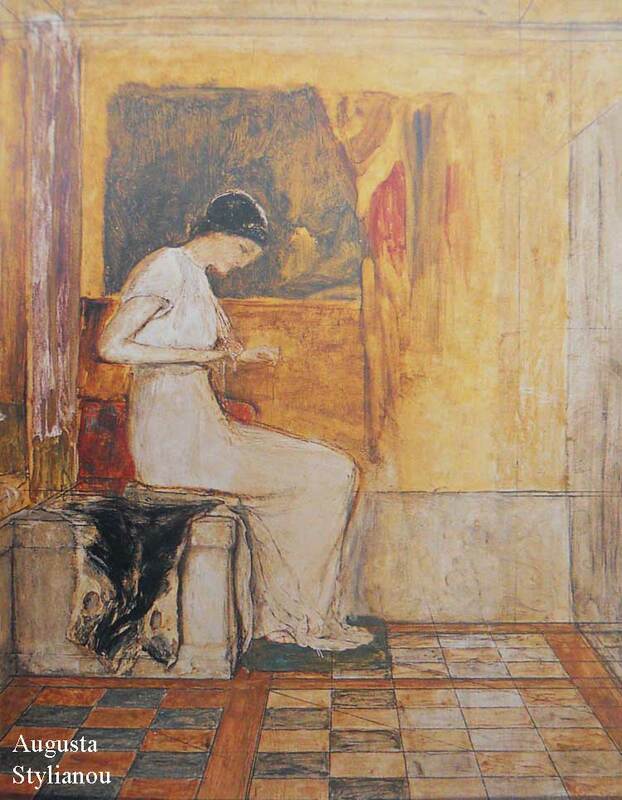 In contrast, the key symbol of The Odyssey is the shroud that Penelope is weaving for her father-in-law, Laertes. This shroud is a piece of fabric, and Penelope weaves it by day and takes it apart by night. She is actually working with the fabric as a means of dealing with her world where Odysseus the King will be returning. (Quick–look for sermon illustrations here.) Fabric is soft, flexible, able to be molded and fitted to different needs. Weaving and working with thread, Penelope fashions a garment to fit the needs of the occasion. There are times and places where we need the hard shield of the old time Calvinism. We need the doggedness of a Machen, the steadfastness of a Warfield, the resolve of a Spurgeon, the antithesis of a Kuyper. At other times and in other places, we need a fabric, something that can be shaped and molded and made to fit. The earthiness of a Luther, the teaching-style of a Calvin, the eye for the wonder of God’s glory of an Edwards, and the imagery of a Spurgeon. Just I recommend both Homeric epics, I recommend both aspects of Calvinism. Much more could be said about how Calvinism, New Calvinism, Reformed theology, or, as I believe, true Biblical theology is both that metallic inflexible weapon of defense, Achilles’ Shield, and Penelope’s soft, flexible, adaptable fabric.